Love pumpkin spice lattes but not so crazy about the price? Keep your money in your pocket and make this homemade pumpkin spice latte instead! Pumpkin spice latte season is here and I could not be more happy about it! I’ve long been a fan of the warming, spicy gingerbread latte, but I didn’t actually try the pumpkin spice latte when it was first released in the U.K. I honestly wasn’t sure if I would like it very much, but after a friend recommended it to me I decided to give it a go. I’m not sure why I was so sceptical about it – after all cinnamon, nutmeg and ginger are some of my favourite spices. And naturally, I was hooked after the first sip. Nowadays I can’t walk past a Starbucks during the months of September/October without going in and treating myself to a grande pumpkin spice and a ginger muffin. I’ve been thinking about coming up with a homemade version for a couple of years now and after a few experiments, this is what I’ve come up with. You might ask, does the blogging world need another pumpkin spice latte recipe? The answer is probably not, but I’m going there anyway. It’s too good not to share. I’m sure if you put a Starbucks pumpkin spice latte and my version together you would probably be able to tell there’s a slight difference, but it’s pretty darn close. Plus think of the money you’ll save! Making your own is so much cheaper. My version is also less syrupy sweet than the coffee house versions, because you’re adding the sugar yourself. It’s warming, slightly spicy and has that familiar, comforting taste. My recipe also contains pumpkin pie spice and pumpkin puree – although I’ve been told that this year for the first time, the Starbucks version also has actual pumpkin in their recipe! I use my stick blender to froth the milk up, but if you have a milk frother you can use that instead. 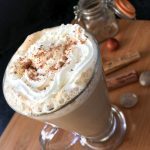 I’ve made the recipe without frothing the milk up, but I don’t recommend skipping this step – it may seem like a bit of a pain, but this is what gives the latte that frothy coffeehouse style foamy top. What kind of coffee should I use? The quality of the coffee you use is really important. You can either use freshly ground coffee or instant espresso. If I don’t have freshly ground coffee to hand or don’t want to make any, I use Nescafé Azera espresso powder – I like my coffee to pack a fairly strong punch, so I use 1/2 tablespoon espresso powder-125ml water. So let me save you a few pounds by showing you how to make your own Starbucks inspired pumpkin spice latte! I’m linking this recipe up with #CookBlogShare, hosted this week by Easy Peasy Foodie. 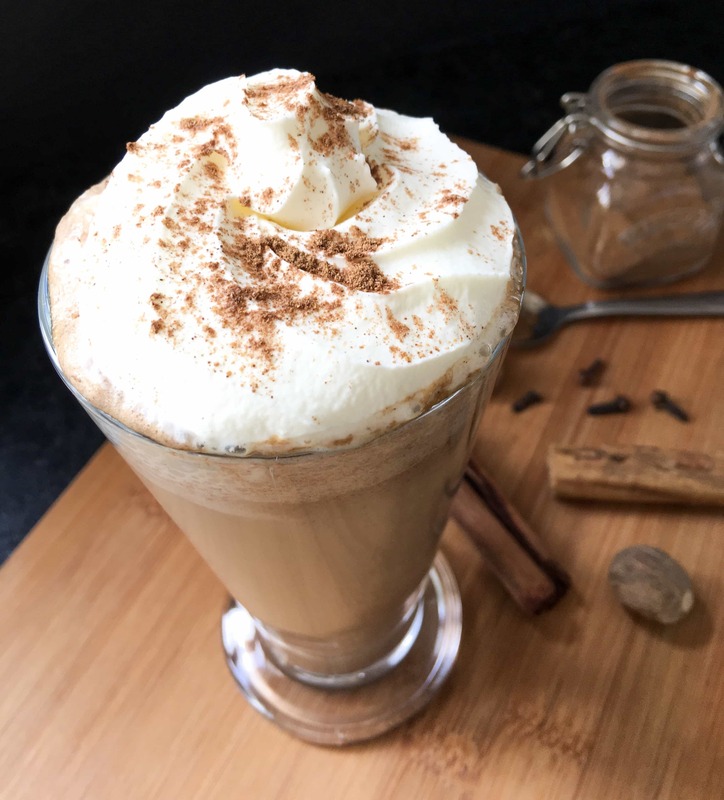 You don't need to visit Starbucks everyday to get your pumpkin spice fix - you can save yourself a small fortune by making this homemade version of the popular Autumn drink! Place 120ml (1/2 cup) of hot, freshly brewed strong coffee in a large mug/latte glass. Place the milk, pumpkin puree, sugar, pumpkin spice and vanila in a small saucepan. Using a whisk, whisk over a low to medium heat until the ingredients are well incorporated. Remove from the heat and using a stick blender, whizz for 30 seconds. If you have a milk frother use that instead! Place back on the hob and heat until the milk is steaming. Remove from the heat and pour over the coffee. Stir and taste to see if you want to add more sugar. 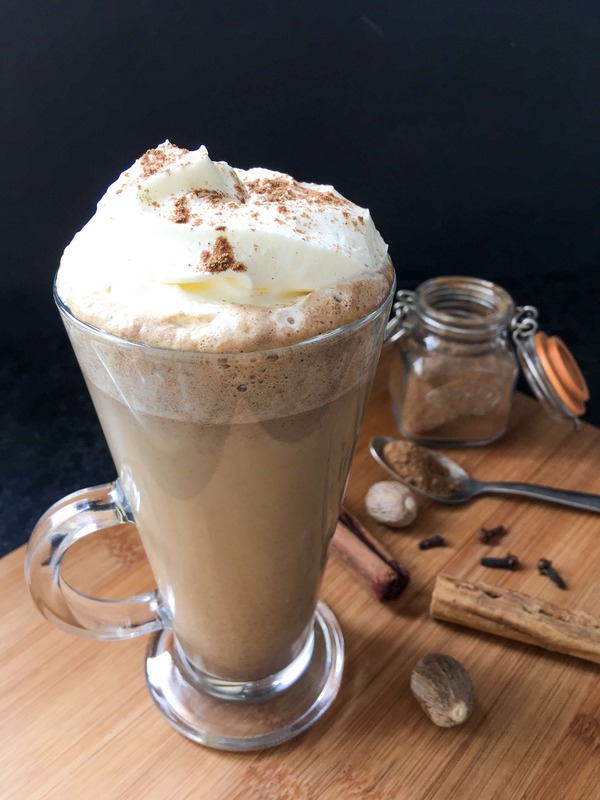 Top with freshly whipped cream and finish off with a sprinkling of pumpkin spice or nutmeg. Make it vegan! Use any non dairy milk - soy or almond would be ideal. Sounds terrific! A bit of Fall in a mug. Yummy! Thank you! Yes, all the flavours of fall in one drink. I can’t get enough of it ? Thank you! I love them, it’s so nice to be able to make them at home ? Hello, This Pumpkin Spice Latte looks delish. I will have to test it. Have a lovely day. Thank you so much Silvie ? Have a lovely day too!